Antonio Conte will be in the dugout for the Azzuri’s qualifier in Bulgaria tonight despite the threats. 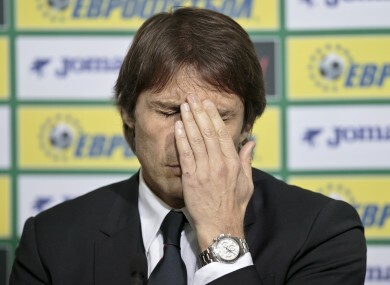 Conte has been 'shaken' by the incidents of the past few days. ITALY COACH ANTONIO Conte is “shaken” after he was the target of death threats ahead of the Azzuri’s Euro 2016 Qualifier in Bulgaria this evening. Conte has been caught in a furore involving former team Juventus after club patron John Elkann reportedly blamed the national team coach’s excessive training for the knee ligament injury sustained by Claudio Marchisio on Friday. The midfielder was ruled out of Saturday’s qualifier after undergoing an MRI scan which revealed a torn anterior cruciate knee ligament inury. He was expected to be out for the rest of the season. However, his club – the Serie A champions – have since played down the extent of the Marchisio’s injury claiming he could return within a matter of weeks. That didn’t stop fans of the Old Lady turning on Conte with the Italian Football Federation President revealing he had been the subject of online death threats. Speaking to Rai Sport, Carlo Tavecchio said: “I saw him [and he was] shaken. Conte has confirmed will be in the dugout for the Group H clash at the Vassil Levski stadium in Sofia tonight. Italy sit joint top of their qualifying group with Croatia, having won three games and drawn one. Email “Italy coach receives death threats after Juve midfielder injured on international duty”. Feedback on “Italy coach receives death threats after Juve midfielder injured on international duty”.